A Cebu jetski rental firm, Jetscape, has launched jetski touring, a whole new way for local and foreign tourists to see different islands around Cebu on board a jetski or speedboat. Jetscape Adventures Inc. general manager Alex Roa said, there are only two other countries in Asia, namely, Thailand and Indonesia, that offer a similar service and theirs cater mostly to foreigners. He said he has not heard of other jetski touring companies in the country. What he noticed are resorts that offer Cebu jetski rental as recreational activity to guests and this is limited to the seawaters near the establishment. He said jetskiing would be a good way to show off various sites to local and foreign tourists in Cebu. Roa and his family invested about P500,000 for each of the three jetskis owned by Jetscape and they hope to recoup their investment in a couple of years. ”We plan to add more jetskis after studying the reception of target markets in a few months,” he said. The standard tour being offered by Jetscapes involves a half-day ride on Yamaha Waverunner jetskis that will be accompanied by a 24-foot chase boat that will be loaded with refreshments and will serve as floating lounge and back-up transport. The package includes a light meal, onboard refreshments, island fees, use of snorkeling gear and US Coast Guard approved personal flotation device. The Jetscape route for the standard tour is approximately 35 miles covering the Mactan-Olango circuit. The jump-off point is from Cebu Yacht Club in Lapu-Lapu City. After cruising through the Magellan Bay, guests will cross the Hilutungan Channel to Olango Island. They will then stop by Caw-oy for a meal before heading off to Gilutongan Island (off Cordova) for snorkeling or sunbathing in Sulpa Islet. Customers of Jetscape Cebu jetski rental can view Mactan’s eastern coastline before circling the northern tip of Mactan and heading back to the Cebu Yacht Club. The tour will take about three to four hours, Roa said. For a single customer, a standard tour will cost P12,800 or P6,800 per person for a group of two. The rate for speedboat passengers is P2,800 per person. 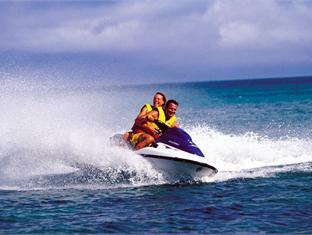 Rates may vary for the Cebu jetski rental, depending on destination and service specified by the customers. The Jetscape office is located at the Cebu Yacht Club in Lapu-Lapu City, Mactan.